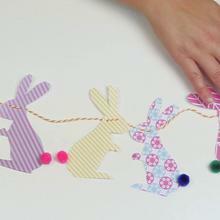 It's very easy to make a garland of rabbits, using the material that you find at home. 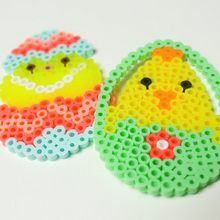 Do you want to be crafty and create a lovely spring decoration for your room or to celebrate [Easter] or just to share some time with a parent, brothers or sisters? Hellokids suggest you discover how to make this cute rabbit garland by watching the tutorial "Bunnies Easter wreath" video. Level of difficulty: Easy, requires cutting precision and concentration. First, print the rabbit model that you will find at the bottom of the page and cut it out. Hellokids suggest you choose from several silhouettes of rabbits according to your tastes. Then put the rabbit model on a patterned pieces of paper and trace the outline with a pencil and cut it out. Repeat this step as many times as you like. Then paste [pompon] to the location of the tail of the rabbit to bring relief and color. 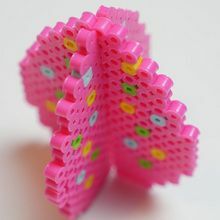 Create two small holes near the head or ears of the rabbit with a hole punch. Please note, holes should be at the same level in all rabbits. To make it easy to put the paper rabbits on your cord without damaging them, wrap the entire string with tape. Alternate right and a left rabbit rabbit to create pairs. After threading the rabbits step is complete, leave at least 20 inches of cord on each side to be able to hang the garland of paper rabbits. And voilá a beautiful garland of rabbits to decorate the house for Easter. So cute!